You have a photos or videos that you want to share with some of your contacts on Instagram, but don't want them to be displayed on your public profile? Well, this can be achieved with Instagram Direct. Open the Instagram app. Take a photo, record a video or simply choose a file from your Gallery and then edit it. Finally tap on the green tick button to share the post with the selected contacts. Published by jak58. Latest update on August 21, 2015 at 10:14 AM by jak58. 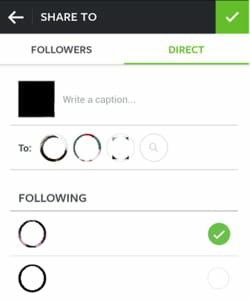 This document, titled "Instagram - How to Share Photos with Specific Contacts," is available under the Creative Commons license. Any copy, reuse, or modification of the content should be sufficiently credited to CCM (https://ccm.net/).